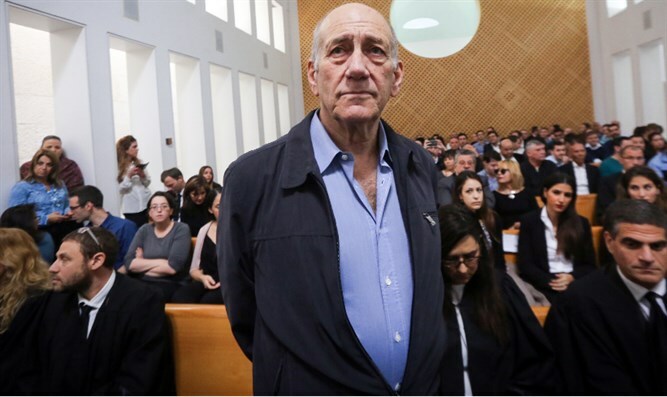 Israeli President refuses to grant pardon to ex-Prime Minister Ehud Olmert, now serving jail term for corruption charges. President Reuven Rivlin has denied former Prime Minister Ehud Olmert’s request for a presidential pardon, obliging Olmert to fulfill the remainder of his jail sentence. Olmert, who served as Prime Minister from 2006 to 2009, was convicted in connection with two separate corruption scandals. In 2016 Olmert, then 70, began his 19-month sentence, becoming the first Israeli Prime Minister to be incarcerated. In his decision to reject the pardon request, President Rivlin wrote that the unique circumstances of Olmert’s conviction and his years of service at the highest levels of government were already taken into consideration by the court when Olmert was convicted and sentenced. Rivlin also noted that the former Prime Minister is slated to meet soon with a parole board, who will determine whether Olmert qualifies for early release.